The 2019 fleece list will be posted soon. Please see the reservation information page for details. We're pleased to be an official fiber provider for The Livestock Conservancy's "Shave 'Em To Save 'Em" program! For any folks who have emailed me concerning fleece and not gotten a reply......... please check your spam filter/file for my email. I answer ALL emails - usually within a day - so if you don't get an answer it's because your question or my reply has gone into limbo. Our non-Cotswold sheep are jacketed during hay feeding season to provide the discriminating handspinner with beautiful fiber free of vegetation. Even uncoated Cotswold fleeces will contain very little VM. Fleeces may be purchased whole or divided in half. Half fleeces are always divided from head to tail. The bred ewe flock is shorn in early March. Unbred animals are shorn later during April as the weather and time alllows. Following shearing, fleeces will be available on a first-come, first-served basis unless reserved. A charge of $20 per fleece will positively hold a particular fleece for you. This fee will be applied to the final purchase price of the fleece. Final price is determined by fleece weight. Expected fleece weights are listed with each fleece. If a flaw is discovered in a reserved fleece, I will email you as soon as it's discovered. Free samples - small lock of the fleece - may be requested to confirm color. Note: If you are outside of the USA, please check with your country's regulations regarding importing RAW fleece prior to purchasing from us. And, additional shipping charges will likely apply. Nice firm crimp, good length and some luster. Age has shortened this fleece slightly but the length is still very usable. A pretty, medium grade fleece. Coated. $18.00 per lb. Full fleece approx. 5-6 lb. Gooseberry's 2018 fleece is reserved for Jennifer G.
A very pretty fleece. Lovely crimp, good workable length and some luster. This is a springy, dense fleece with a soft hand. Coated. $18.00 per lb. Full fleece approx. 7-8 lb. Snowflake's 2018 fleece is reserved for Sara B. This fleece is definitely on the fine side of medium. Almost a fine, but not quite. Super soft and crimpy. Good luster for the fineness. Coated. $18.00 per lb. Full fleece approx. 7-8 lb. Angel's 2018 fleece is reserved for Carol G.
A lovely medium grade fleece with wide flat locks, firm crimp and good luster and length for the grade. Coated. $18.00 per pound. Full fleece approx. 8-9 lb. Daisy's 2018 fleece is reserved for Rita B.
Crimpy, crimpy! On the far fine end of medium grade, soft, skinny little locks, a bit cream colored with some luster. Coated. $18.00 per pound. Full fleece approx. 6-7 lb. Marshmallow's 2018 fleece is reserved for LIz C.
Medium grade, soft, a bit cream colored. Very nicely crimped with some luster. Coated. $18.00 per pound. Full fleece approx. 6-7 lb. Wee Little Guy is a small ram who had a rough start in life but is now hale and hearty and very sweet. Too small to make a sensible breeding ram, he is instead a companion for the big rams and a fleece producer. On the heavier end of medium grade. I almost put him in the long category due to a wide crimp but the fleece handles more like a soft medium. Nice luster for the grade. Coated. $18.00 per pound. Full fleece approx. 7-8 lb. Wee Little Guy's 2018 fleece is reserved for Mandi B. This fleece has the luster and crimp of a long wool although it is softer and somewhat shorter like a medium grade, but I kept it in the Long Wool category. She's lost some length to age but it's still a pleasant length to spin. The crimp is soft and the wool has a nice, drape-y handle. Full fleece approx. 6-7 lb. Coated. $18.00 per lb. Lovely big, blocky locks, stongly defined crimp and high luster. There does seem to be some yellowing to the fleece except along the middle of the back. It may or may not wash fully white, so a dye project (or butter color yarn) should be in your plans. Coated. $18.00 per lb. Full fleece weighed 7-8 lb. Luna's 2018 fleece is reserved for Vallery M.
This fleece shows a lot of Cotswold traits - strong, very high luster and a curl at the tips. A nice bright white. Coated. $18.00 per lb. Full fleece approx. 8-9 lbs. Pretty's 2018 fleece is reserved for Jennifer G.
Gray with nice crimp and some sparkle for the grade. He's losing some length to age but still a usable staple. Tux also has a few white spots on his neck and sides, so fleece will contain a small percentage of white which can be easily separated. Coated. $18.00 per lb. Full fleece approx. 7-8 lbs. Tuxedo's 2018 fleece is reserved for Wende G.
A really soft fleece with some luster for the grade. She's given up some length to age but still a very usable length. Coated. $18.00 per lb. Full fleece approx. 5-7 lb. Foxy's 2018 fleece is reserved for Patti S.
Very soft, nice crimp. On the fine side of medium. Alllllmost a fine. She has faded tremendously to an earthy sand color. Coated. $18.00 per lb. Full fleece approx. 6-7 lb. Kahlua's 2018 fleece is reserved for Mandi B. Very strong, bold crimp with good luster. Has faded from black to varying shades of gray. Really pretty, and light sections are pale enough to overdye with beautiful results. Coated. $18.00 per lb. Full fleece approx. 6-7 lb. Onyx's 2018 fleece is reserved for Mandi B. A nice medium fleece in a pleasant medium brown color. Nicely defined crimp and having a very soft hand with some sparkle. Coated. $18.00 per lb. Full fleece approx. 8-9 lbs. Flower's 2018 fleece is reserved for Kelley R.
A very soft handling fleece on the fine end of medium. Faded to beautiful pale gray shades. Nicely crimped and soft handling. Coated. $18.00 per lb. Full fleece approx. 8-9 lb. Domino's 2018 fleece is reserved for Sara B. A medium fleece, but on the fine side of medium. Soft hand with good luster for the fineness. Pronounced crimp and nice lock formation. Coated. $18.00 per pound. Full fleece approx. 7-8 lb. Ginger's 2018 fleece is reserved for Diane W.
This medium fleece is on the heavier end of the grade. Although she started out dark moorit, Bacardi faded in her first year to this pretty oatmeal shade. Plenty light enough to dye if you wish, but lovely as it is. Pronounced crimp and good luster. Nice! Coated. $18.00 per lb, full fleece weighs 9-10 lb. Half Bacardi's 2018 fleece is reserved for Ariel H.
Half Bacardi's 2018 fleece is reserved for Cheryl A. This fleece is on the finer end of medium, but still falls into that grade. Very soft hand, great crimp, good length for the fineness. Copper was born dark moorit, but has faded to pale sand . Coated. $18.00 per lb, full fleece weighs 7-8 lb. Copper's 2018 fleece is reserved for Marina G.
This is a really pretty fleece. Medium, but on the fine end. Very soft hand, soft crimp, nice length for the fineness. Quite a bit of luster for the grade. Slight variation in coloration and some white spots over the back. Coated. $18.00 per lb, full fleece weighs 8-9 lb. Half Sweetie's 2018 fleece is reserved for Debra K.
Half Sweetie's 2018 fleece is reserved for Claudia L.
Email usThis pretty fleece is medium, but on the fine end. Very soft hand, good crimp, good length for the fineness. Quite a bit of luster for the grade. Coated. $18.00 per lb, full fleece weighs 6-7 lb. Tiffany's 2018 fleece is reserved for Meg C.
This pretty fleece is medium, but on the fine end. Very soft hand, good crimp, good length for the fineness. Very pale moorit. Quite a bit of luster for the grade. Coated. $18.00 per lb, full fleece weighs 8-9 lb. Chemise's 2018 fleece is reserved for Dina J. A solid medium type fleece. Minimal luster, has a few gray strands in the black making it a dark charcoal rather than jet black. 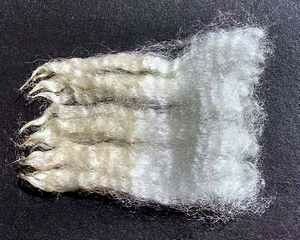 Crimp is typical for a medium wool but rather disorganized and doesn't show well. Coated. $18.00 per lb, full fleece weighs 7-8 lb. Solid charcoal with a good hand but it's definately on the coarse end of medium. Moderate luster, defined crimp and a crinkly, crispy texture. Coated. $18.00 per lb, full fleece weighs 7-8 lb. Half Mickey's 2018 fleece is reserved for Jill R.
Half Mickey's 2018 fleece is reserved for Cheryl A. Although they are twins, Minnie's fleece is quite different from Mickey's. It's mid-range for a medium fleece, more luster, defined crimp and a softer hand than Mickey. Coated. $18.00 per lb, full fleece weighs 7-8 lb. Half Minnie's 2018 fleece is reserved for Chris V.
Half Minnie's 2018 fleece is reserved for Debra T.
Medium grade, moderate luster, faded to a pale sand color. Blunt, blocky locks. Wool is firm and almost crispy in texture. Coated. $18.00 per lb, full fleece weighs 7-8 lb. Salsa's 2018 fleece is reserved for Judy P.
Freckles has faded to a gorgeous light gray. Grade is the fine end of medium with minimal luster and is super crimpy. Coated. $18.00 per lb, full fleece weighs 8-9 lb. Half Freckles' 2018 fleece is reserved for Shiralyn Y. Half Freckles' 2018 fleece is reserved for Carrie J.
Carmel is a super crimpy fine-ish medium with a long staple for the grade. She's faded to a beautiful pale sand color. Coated. $18.00 per lb, full fleece weighs 8-9 lb. Carmel's 2018 fleece is reserved for Rita B.
Castillo is a ram with a nicely crimped, mottled gray fleece. Soft hand and some luster. Coated. $18.00 per lb, full fleece weighs 8-9 lb. Half Castillo's 2018 fleece is reserved for Patti S.
Half Castillo's 2018 fleece is reserved for Diane A.
Violet has faded to a uniform, pretty gray. Pronounced crimp and soft with minimal luster. Coated. $18.00 per lb, full fleece weighs 6-7 lb. Violet's 2018 fleece is reserved for Jennifer G.
Beautiful spotted fleece. Mostly charcoal but with patches of mottled gray. Probably 80% charcoal and 20% gray. Pronounced crimp and soft with high luster. Coated. $18.00 per lb, full fleece weighs 6-7 lb. Half Yahtzee's 2018 fleece is reserved for Ariel H.
Half Yahtzee's 2018 fleece is reserved for Chris V.
Pronounced crimp and soft, on the fine end of medium. Good sparkle for the grade. Almost solid gray, but some color variation. Coated. $18.00 per lb, full fleece weighs 6-7 lb. A nice solid medium fleece with pronounced crimp and softness. This is a soft black shaded with gray which will likely continue fading in coming years. Coated. $18.00 per lb, full fleece weighs 6-7 lb. This is a lovely gray fleece. Good crimp, some luster, soft hand and good length for the grade. I almost put him in 'long wool' but we'll keep him in medium for now. Coated. $18.00 per lb, full fleece weighs 7-8 lb. Half Brick's 2018 fleece is reserved for Shiralyn Y. Half Brick's 2018 fleece is reserved for Ariel H.
Excellent luster and hand. The fiber just sparkles. Well defined crimp and soft. Coated. $18.00 per lb. Full fleece approx. 6-7 lbs. Gem's 2018 fleece is reserved for Francine J. Good length and a sturdy crimp. High luster and a nice hand. Has faded from jet black to an even, medium gray. Light enough to overdye if you wish. Coated. $18.00 per lb. Full fleece approx. 7-8 lbs. Peaches' 2018 fleece is reserved for Debra T.
Long, strong, bold and shiny. This mostly Cotswold crossbred is flecked with gray and may turn lighter yet with time. Heavy, lanky locks with good crimp. Coated. $18.00 per lb. Full fleece approx. 9-10 lbs. Ashes' 2018 fleece is reserved for Judith B. Long, strong and shiny. This mostly Cotswold crossbred has several gray shades through the fleece as the picture at left shows. Long lanky locks with a pretty wave. Coated. $18.00 per lb. Full fleece approx. 7-8 lbs. Fuzz's 2018 fleece is reserved for Dawn J. Long, soft, good luster and a faded to a handsome gray. Prettier than the picture - I had to dull it down to show the crimp. Coated. Full fleece approx. 9-10 lbs. $18.00 per lb. Snickers' 2018 fleece is reserved for Carrie J. Good luster and strong crimp except at the britch. This fleece has multiple personalities - CVM/Rambouillet on the front half and Cotswold on the back half. Finer wool is 5.5 inches ranging up to 8.0 inches at the britch. A multi-tasking fleece for multiple projects! Pretty, mottled dark gray. Coated. Full fleece approx. 8-9 lbs. $18.00 per lb. Cocoa Puff's 2018 fleece is sold. Distinct crimp, some luster, mostly dark gray with black at neck and lower legs. Coated. $18.00 per lb. Full fleece approx. 7-8 lbs. Strong crimp but still soft handling. Gray shades with some nice luster. Coated. $18.00 per lb. Full fleece approx. 6-7 lbs. Chantilly's 2018 fleece is reserved for Kimberly W.
Laverne's 2018 fleece is reserved for Susie P.
High luster. Curl type varies but hand and length is very nice. Coated. $18.00 per lb. Full fleece approx. 8-9 lbs. Octavia's 2018 fleece is sold. High luster and small/narrow curls. Coated. $18/lb. Full fleece approx. 8-9 lbs. Odessa's 2018 fleece is reserved for Liz C.
High luster. Soft with big wavy locks rather than tight curls. Coated. $18.00 per lb. Full fleece approx. 7-8 lbs. Olga's 2018 fleece is reserved for Dawn J. High luster and very good length. A bit coarser than some but handles nicely. Born with colored fleece from the loin area back. Now that area is faded to a super pale gray (long locks at top of pic, left). Coated. $18.00 per lb. Full fleece approx. 7-8 lbs. Big, sturdy curls with good luster and very good length. Coated. $18.00 per lb. Full fleece approx. 7-8 lbs. Peanut's 2018 fleece is reserved for Liz C.
High luster and very good length and curl. Coated. $18.00 per lb. Full fleece approx. 7-8 lbs. Popcorn's 2018 fleece is reserved for Liz C.
Nice fleece all around - good curl formation, luster, hand and length. Coated. $18/lb. Full fleece 7-8 lbs. Portia's 2018 fleece is reserved for Susie P.
Goober's 2018 fleece is reserved for Carrie T.
High luster fleece with a very nice hand and little narrow curls. Pretty! Coated. $18/lb. Full fleece 7-8 lbs. Prudence's 2018 fleece is reserved for Liz C.
Good curl type through shoulders and back, loosening up along sides and hips. Good luster, nice hand. Pretty shades of gray. Coated. $18/lb. Full fleece 5-6 lbs. Shades of gray from light to dark but mostly silver. High luster, curl type varies from slightly curly to mostly loose/wavey. Coated. $18/lb Full fleece approx. 8-9 lbs. Strong fleece in shades of gray (about 50/50 light to dark) with a nice silky hand and very high luster. Curls are soft/loose. Coated. $18 per lb. Full fleece approx. 7-8 lbs. Pixie's 2018 fleece is reserved for Francine J. Shades of gray, but mostly very pale silver. High luster, strong fleece with wavy locks. Coated. $18 per lb. Full fleece approx. 7-8 lbs. Poppy's 2018 fleece is reserved for Marsha B. We sell raw, skirted Cotswold fleece by the pound or by the whole fleece. Curl character does vary, so let us know your plans for the wool and we can pick a fleece that will perform the best for your project. $18.00 per lb if buying by the pound. If you are interested in whole fleeces, please email us as weights will vary but generally run 9-10 lbs.